Welcome back to our four-part article series on All on 4 dental implants in Houston. In our previous post, we discussed the key differences between this breakthrough dental implant protocol and that archaic tooth replacement technology, removable dentures. In this article, the third installment of the series, we shall be exploring how All on 4 dental implants make it possible for specially-trained and experienced implant dentists to provide patients with a new set of non-removable teeth, almost always without the need for bone grafting surgery first. We shall then discuss the benefits of this unprecedented feat in implant surgery. In our previous article post, we discussed the importance of the roots of your teeth in keeping the underlying jaw bone stimulated and alive. Just like the muscles in your body, if bone doesn’t get exercised, it atrophies and wastes away in volume. 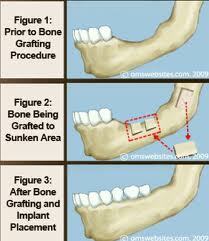 Removable dentures only replace the visible part (the crowns) of your teeth. 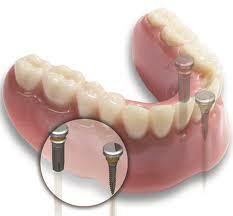 But All on 4 dental implants in Houston replace both the roots AND the crowns. As such, they help to keep a patient’s jaw bone alive and healthy. But what All on 4 dental implants are really known for are their ability to provide comprehensive tooth replacement solutions to patients who have gone without teeth and/or with removable dentures for so long that they have lost a substantial amount of jaw bone volume. 3. It is very expensive. The result of all this is that patients would have to wait up to 18 months before they could get a complete set of new teeth placed. This is not even to mention the tens of thousands of dollars oral rehabilitation cost them. No wonder so many of them opted instead for removable dentures! Through the precise placement and angulation of four dental implants in regions of the mouth that naturally contain a greater volume of atrophy-resistant bone tissue, trained implant dentists are able to provide enough support for a customized prosthetic dental bridge WITHOUT the need for bone grafting first. This is true in most patient cases and the result is that All on 4 dental implants in Houston can almost always provide patients with a brand new set of non-removable, immediately functional teeth in as little as a single day, with a single surgery! This unprecedented feat in oral rehabilitation is also made possible by the fact that All on 4 dental implants in Houston, as the name suggests, only requires four dental implants per jaw in order to provide patients with a complete set of teeth. Older and more traditional surgical protocol frequently required as many as 20 dental implants for oral rehabilitation. These dental implants could not all be placed in a single surgery. And so, a patient’s journey to oral rehabilitation would have to be broken up into multiple surgeries and recovery periods. Can you see the costs mounting up here? With only four implants required, All on 4 dental implants in Houston can be placed in a single surgery, enabling patients to go from being completely toothless to having a full and confident smile… all in a single day! This breakthrough surgical protocol also saves patients from unnecessary discomfort, exorbitant medical bills and all that time off from work and life! To read the answers to some of patients’ frequently asked questions about All on 4 dental implants in Houston, stay tuned for the final installment of this four-part article series.